← What Is Propaganda All About? NON-PROFITS & CHARITIES: INTERCHANGABLE TERMS? Hurricanes Harvey, Irma, and now Maria – which barreled through Puerto Rico recently – are the kinds of disasters that galvanize Americans f all political persuasions to pitch in with donations and support for various charities and non-profit organizations that provide help in the wake of such disasters which displace thousands or millions of people. These people would be in a lot of trouble without these non-profits and charities because they can often provide what is needed much quicker and without all the bureaucratic red tape that a government agency would offer –and whose red tape may reduce the amount that the government may actually give. Charities and non-profits both serve wonderful missions in serving others, especially those in need due to weather events, economic or financial issues, or food shortages. Charities and non-profits are valuable in these situations, but often people tend to consider both terms interchangable. However, they are not. Let us put it this way – all charities are non-profits, but not all non-profits are charities. A charity is designed to spend its donations and other income streams on resources to support the public good. Non-profits have a business or corporate mission but its profits benefit no individual; they are invested directly back into the business or a grup (hurricane victims, for example). Charities are run primarily by volunteers. Charities generally have fund-raisers and don’t sell services or goods. 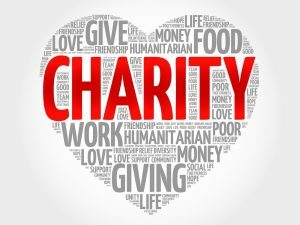 Non-profits sell goods or services and have very few fundraisers other than to support a specific cause or event that is not related to the core business. Charities are usually treated as tax-exempt organizations. Non-profits are treated as every other corporation for tax purposes. A chamber of commerce is a non-profit. A homeless shelter is a charity. A church is a charity. A hospital is a non-profit. A school is a charity. A homeowners’ association (HOA) is a non-profit. The American Red Cross is a charity. A political party or political action committee is a non-profit. This is not to say that you should only contribute or donate to a charity because it is inherently better than a non-profit. Although a non-profit is a considered a corporate entity, it does not have a profit motive, which makes it similar to a charity in that is is created to serve. Certain organizations are best operated as a non-profit rather than a charity, but they both have honorable and altruistic missions and motives. And during hurricane season, those who have faced the wrath and survived will depend on both entities to get back on their feet and get back to normal life and thumb the nose at what evil hath wrought. Comments Off on NON-PROFITS & CHARITIES: INTERCHANGABLE TERMS?